Guilt free global warming… Nice, huh? Who would want any harm to come to cute, loveable, wild animals? Whose heart strings wouldn’t be touched by possible suffering of God’s creatures, who exist at the mercy of evil man and his destructive engines of industry and his polluting, consumerist lifestyle? How could any person turn a deaf ear to protecting defenseless creatures, especially when sinful human excesses are causing global trauma in the worlds animal communities? Be ashamed Human. Be very ashamed. Oh, and here’s a way to purge your sinful transgressions, return to guilt free activity and maintaining life as you want it, assuming you can afford to. You, too, can continue to live exactly as you had before. All you have to do is send cash to the appropriate sin-elimination center of your choice, and they will plant trees or build a big windmill for you and your loved ones. Eco-sin problem removed, life goes on. Well, not exactly. But then, religious charlatans go back eons. The difference now is, where guilt and shame are necessary human emotions to cause a search for relief and purpose in life, eco-guilt is a sham, set up to extort cash and power from other humans. People are, after all, spiritual beings. Longing for a connection with something bigger and grander than everyday human life is universal. Filling this inner need, this unfilled void that plagues us all, is a vulnerability waiting to be exploited, sometimes by the most bizarre, and even destructive. Enter the Church of Anthropogenic Climate Change and Guilt Relief Sales Center. Now, there is nothing wrong, and a lot right, with the human instinct to try to understand man within a larger transcendental context. The arrogant and monstrously dilated individual human ego is the direct cause of much of mankind’s suffering throughout our benighted existence. And while I have my own religious thoughts, I will not disdain any man’s search for the transcendent. But a religion should be understood by both its adherents and others for what it is — a religion. The trouble with global-warming believers is that probably most of them delude themselves into thinking they are practicing science — not religion. Please read complete article here. 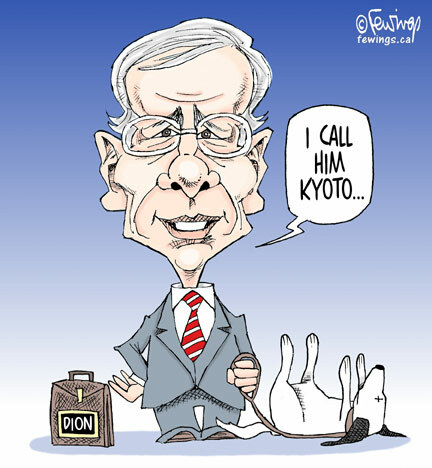 I’m pleased to see 60 Canadian scientists implore their government to withhold billions in tax dollars allocated to implement the Kyoto protocols. Their research shows that, knowing what we do now about Co2 and other “greenhouse gas” emissions, signing on to Kyoto’s regulations weren’t necessary in the first place. The estimated temerature change of 0.0015 degree celcius and a cost of 150 billion dollars relegates this failed boondoggle to the ash heap of history, or so you would think. Insisting the Canadian government revisit shaky claims of anthropogenic, catastrophric global warming and reel in environmental knee-jerk restrictions caused by junk-science, the group hopes that a sounder platform be constructed of actual, provable scientific investigation and not merely guestimations akin to the previous global scare of an impending ice age, which failed the test of time. Imagine your whole world view of a condition ending with the literal drowning of billions of people being surmised and solidified by viewing a cartoonish docu-drama produced by a politician whose goal is to become president of the United States, and who wrote a book highlighting the need for the banning of the gasoline combustion engine. Think this guy might want to exaggerate the dark side? Uh, yeah. The new “green” president would then propose, and see through a willing Congress, environmental strongman legislation and executive signing statements directing massive government intervention into the everyday lives of citizens and Orwellian abuses unlike America has ever seen, all in the name of the “common good” and salvation of mankind. No way, you say? Has anything the UN supported EVER been good for the US or any free people on this earth? Absolutely not. I implore any other scientific body to petition their respective governments, insisting federal funds be withheld until REAL science can be applied to this issue. No more pandering to leftists worldwide, itching for control of money and power to implement far reaching, draconian regulation created to thwart commerce and destroy personal freedoms. In typical, capitalist fashion, odd for a leftist, Dion also had this to say about the MONEY MAKING aspects of climate change exploitation. Excellent resource for exposing global warming chicanery. Newsweek, 1975, insists politicians, reluctant to thrust the nation into massive, life altering measures at great expense, were reticent and irresponsible for ignoring the “grim reality” of the coming GLOBAL ICE AGE. Simple mistake? Only too human miscalculations? Hardly. The same crowd that brought us death and destruction by overpopulation, starvation, resource depletion, pollution and the ice age now shift the current end of the world scenario to global warming, with melting glaciers, catastrophic floods, massive hurricanes and deserts where none existed before. You’ll often hear the left lecture about the importance of dissent in a free society. Start by challenging global warming hysteria next time you’re at a LoDo cocktail party and see what happens. The only inconvenient truth about global warming, contends Colorado State University’s Bill Gray, is that a genuine debate has never actually taken place. Hundreds of scientists, many of them prominent in the field, agree. Gray is perhaps the world’s foremost hurricane expert. His Tropical Storm Forecast sets the standard. Yet, his criticism of the global warming “hoax” makes him an outcast. Thank God they did nothing. Imagine how warm we’d be? Pielke contends there isn’t enough intellectual diversity in the debate. He claims a few vocal individuals are quoted “over and over” again, when in fact there are a variety of opinions. 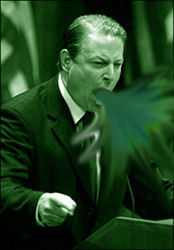 Al Gore (not a scientist) has definitely been heard – and heard and heard. 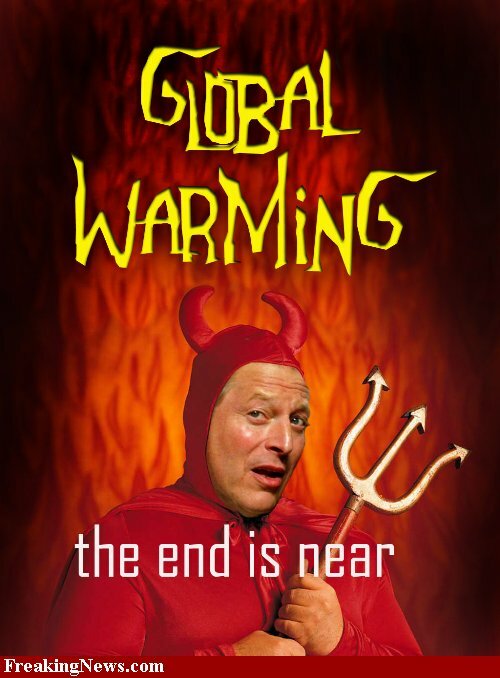 His documentary, “An Inconvenient Truth,” is so important, in fact, that Gore crisscrosses the nation destroying the atmosphere just to tell us about it. So next time you’re with some progressive friends, dissent. Tell ’em you’re not sold on this global warming stuff. Back away slowly. You’ll probably be called a fascist. Don’t worry, you’re not. A true fascist is anyone who wants to take away my air conditioning or force me to ride a bike. David Harsanyi’s column appears Monday and Thursday. He can be reached at 303-820-1255 or dharsanyi@denverpost.com. Scared to death about Global Warming? Self deception starts at an early age. What if you had staked your reputation on an idea that made perfect sense? It sounded plausible, probable even, and held an allure that endowed you with a sense of pride just by being involved. In the larger picture, it met certain needs that you might have. For instance, you may have felt parental. Maybe obedient. Possibly superior to those who ignored the message and failed to act. You might have issued stern warnings to others of the seriousness and validity of your cause that fell on deaf, and stupid, ears. Then, what if it’s discovered you were wrong? What if the nobility and smug self-assurance was just a self-indulgement mirage? Imagine being totally committed, your time, talent and treasure invested in a grand cause…that never existed in the first place, other than in the group psychoses of those involved? At some point, your forced to stop, reconsider your actions, face facts and (I realize not everyone can or will do this), admit your zealous efforts, so gleefully exercised, were in vain. Eventually, you must halt your personal crusade, stop pretending and swallow your pride. In an ideal circumstance, you would work to make amends for any damage you had caused, including half-truths you may have told, intentional deceit you had used to your advantage, and ask the forgiveness of anyone you judged as unwise or just plain evil for disagreeing with you. Pride is truly the greatest sin. Everyone knows that, right? The Weather Channel started its “It Could Happen Tomorrow” series in January 2006. The program includes episodes where a tornado destroys Dallas, a tsunami destroys the Pacific Northwest, Mount Rainier erupts and destroys nearby towns, and San Diego is devastated by wildfires. A climber walks past a glacier at the summit of Mount Kilimanjaro, one of the world’s largest volcanoes and the highest free-standing mountain, in Tanzania in this January 4, 2006 file photo. The mountain has become an icon for environmental campaigners, with scientists predicting that the its glaciers will vanish within the next 20 years because of global warming. On January 10, 2007, the European Union urged for the cut in emissions of greenhouse gases by at least 20 percent by 2020 from 1990 levels as part of a new energy policy to fight climate change. It also called on developed nations around the world to cut emissions of gases blamed for global warming by 30 percent by 2020, saying the EU would go beyond its unilateral target if others followed suit. MALTA OUT REUTERS/Darrin Zammit Lupi They omitted a program showing a meteor striking my house, for it, too, could happen tomorrow. Of course, any one of these events could happen tomorrow, but I’m reminded of a passage in Shakespeare’s “Macbeth,” where after Macbeth listens to the predictions of the witches, Banquo warns him that “Oftentimes, to win us to our harm, the instruments of darkness tell us truths, win us with honest trifles, to betray us in deepest consequence.” That is, gain our confidence with trifle truths to set us up for the big lie. The big lie, conceived by the Weather Channel in cahoots with environmental extremists, is to get us in a tizzy over global warming, and they’re vicious about it. Dr. Heidi Cullen, the Weather Channel’s climatologist, hosts a weekly program called “The Climate Code.” Dr. Cullen advocates that the American Meteorological Society (AMS) strip their seal of approval from any TV weatherman expressing skepticism about the predictions of manmade global warming, according to a report by Marc Morano, communications director for the U.S. Senate Committee on Environment & Public Works. 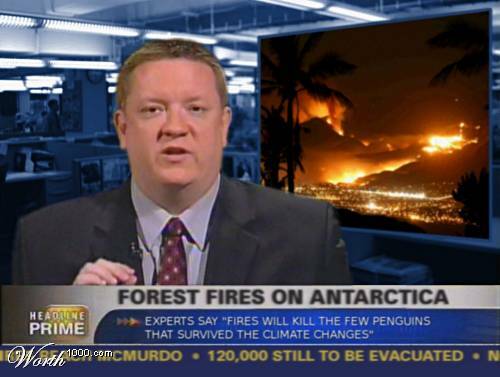 Dr. Cullen has had a lot of help in demonizing skeptics of catastrophic manmade global warming. Scott Pelley, CBS News “60 Minutes” correspondent, compared skeptics of global warming to “Holocaust deniers,” and former Vice President Al Gore calls skeptics “global warming deniers.” But it gets worse. Mr. Morano reports that on one of Dr. Cullen’s shows, she featured columnist Dave Roberts, who, in his Sept. 19, 2006, online publication, said, “When we’ve finally gotten serious about global warming, when the impacts are really hitting us and we’re in a full worldwide scramble to minimize the damage, we should have war crimes trials for these bastards — some sort of climate Nuremberg.” (See the Morano report He didn’t say whether the death penalty should be administered to those found guilty of global warming denial. The environmental extremists’ true agenda has little or nothing to do with climate change. Their true agenda is to find a means to control our lives. The kind of repressive human control, not to mention government-sanctioned mass murder, seen under communism has lost any measure of intellectual respectability. So people who want that kind of control must come up with a new name, and that new name is environmentalism. They added, “It was only 30 years ago that many of today’s global-warming alarmists were telling us that the world was in the midst of a global-cooling catastrophe. But the science continued to evolve, and still does, even though so many choose to ignore it when it does not fit with predetermined political agendas.” These scientists have probably won The Weather Channel’s ire and might be headed toward a Nuremberg-type trial. Dr. Williams serves on the faculty of George Mason University as John M. Olin Distinguished Professor of Economics and is the author of More Liberty Means Less Government: Our Founders Knew This Well. Tasty ending to greenhouse emissions…. What would motivate a person to concoct a fairy tale to rationalize a new impetus to control the behavior of fellow individuals and the economic system which feeds them? Who would present sketchy details to substantiate a framework for altering the course of human activity and, rather cleverly, assign the blame and necessity for this radical change to the humans themselves? What kind of people would elevate the object in question to cultic-diety status and become deeply emotionally involved in silencing dissent and relegating detractors to simply evil, greedy unbelievers? There are 1.3 billion cows on this planet, and every year each cow produces about 90kg of methane, and as greenhouse gases go, methane is about 24 times worse than CO2 in sealing the heat in the air. According to a recent report by the UN’s Food and Agriculture Organisation, agriculture produces 18 per cent of the world’s greenhouse gases, as measured in CO2 equivalent — and that, my friends, is more than is produced by the entire human transport industry. Think of it: for every cow you killed, you would be ridding the world of 90kg of methane a year — easily enough, surely, to justify an Easyjet flight. Now it may be that you are repelled by the idea of killing a cow, and you may think that the poor farmers will only be driven to breed a new one to replace it. But there are still plenty of other things you could do that would make more sense than planting trees with these carbon offset companies. You could make sure that your house was properly insulated. You could turn down the central heating and wear more sweaters; and if you really wanted to tackle global CO2 emissions, you would campaign for nuclear energy, since power production is responsible for 24 per cent of global emissions. Or better still you could help do something to stop Third World countries from burning the forests, which produces 18 per cent of CO2. But, of course, people aren’t interested in these kinds of facts. They want the religion. They want the sweet moralistic feeling of telling someone to stop doing something. They want to be able to rage about Chelsea Tractors and Tony Blair’s flights, and they want to give vent to their feelings of disgust at the whole triumph of Western consumerist capitalism; and what worries me is that, in the end, the moralising mumbo-jumbo becomes more important than the scientific reality. We face huge decisions, such as whether or not to allow scientists to use human genetic material in animal cells; and I want those decisions taken on the basis of whether or not the advance can help cure disease, not on the basis of “Frankenbunny” headlines. 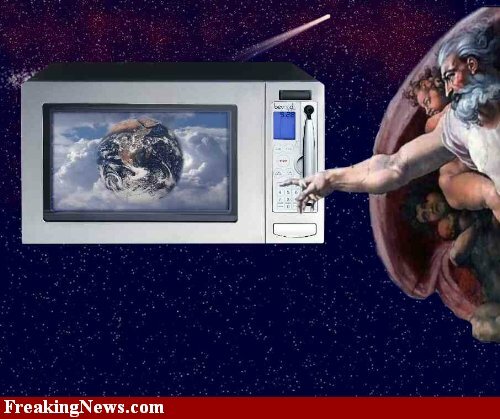 We should cease our pagan yammering for sacrifice, and look at what the science really demands. It is a sign of our terrifying ignorance that so many would still prefer to plant a heat-producing tree than see the wisdom of the ancients, and kill a flatulent cow.